All our services are performed by trained and highly skilled company employees. We do not subcontract our work. We at 20/20 provide you the total window cleaning solution for your home. Your view of the red rocks will soon be the way it was meant to be. We only use environmentally safe solutions that will not pose a threat to you, your home, or the environment. 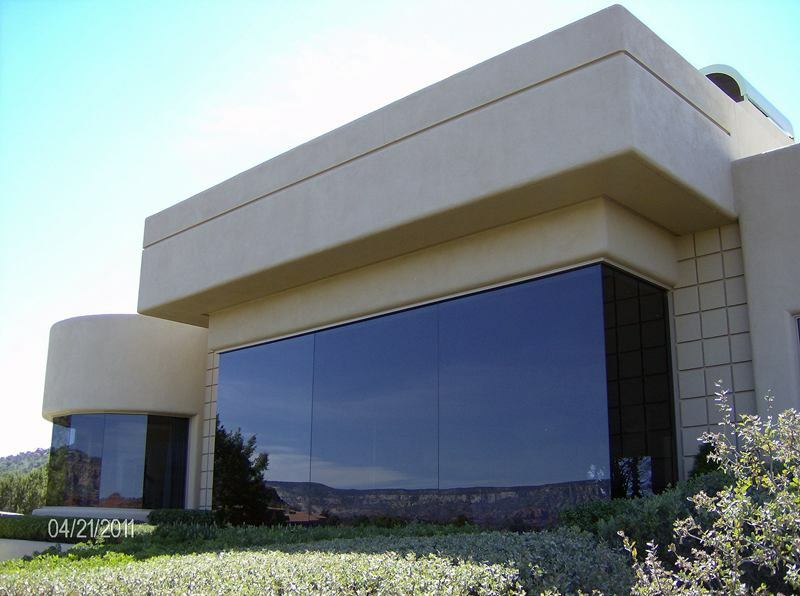 What you can expect from our professional window cleaning process. • All adhesions to the glass like paint drips and overspray, tape, and the all impressive bird art will be removed safely without scratching your glass. • All edges and corners will be detailed with our special lint free towels to guarantee you a drip free window cleaning, leaving the windows cleaner than the competition. • Your window tracks and sills are wiped clean. • We will always take extra care in protecting your home by wearing shoe covers and put towels under our buckets. • When ladders are used we protect your property by using ladder mitts. Our Service and Quality is Unmatched! For 20/20 Window Cleaning there is no job to big or to small for us to handle. We can do the windows on a small coffee shop on up to the size of a hospital. Look in our photo gallery to see what kind of work that we do. New construction clean up on windows is a job you do not want to leave in the hands of inexperience. Because of the very high cost of new windows, it is extremely important that you hire a professional window cleaner. The debris left on a window after a construction job is not an easy task, as there are many little things one must know to not scratch a window. I have seen jobs where people try to save some money and hire a cleaning company to come in and they only find that the one scratched window has now cost them more than if they would have had a professional do it. Trust me, this is not something you want to cut corners on. We have 25 years experience in the field of construction clean up and to date, still have never had to replace a window. We take special care when removing debris and only use the most up to date tools. 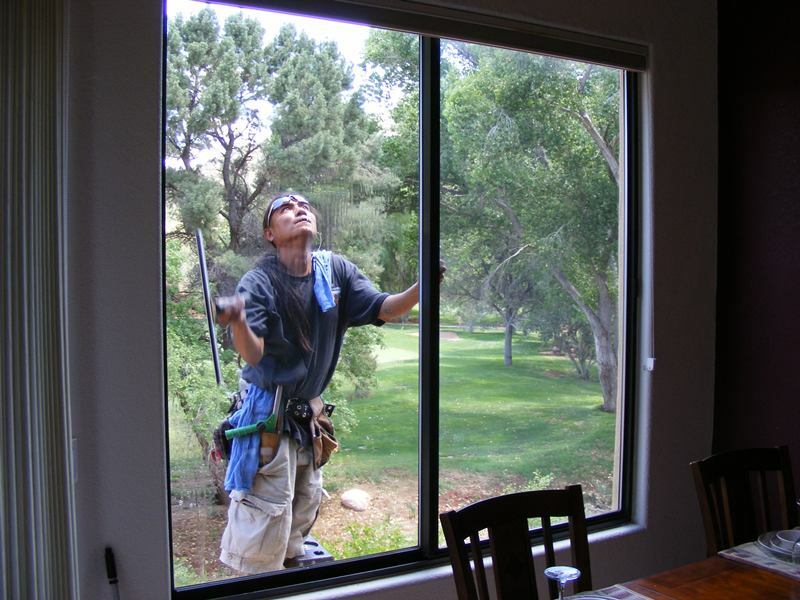 Our crew is knowledgeable to which windows can be scraped and which windows need other types of attention. Is your window, mirror, or glass table top damaged? 20/20 Window Cleaning is the scratch repair specialist. Whether your damage is done with graffiti, done during the construction phase of your home, or it is stained with hard water, we can repair your windows at a fraction of the cost of window glass replacement. We use the newest technology in glass scratch repair with the Auto Stock repair system. Where other scratch repair machines throw white liquid slurry everywhere, Auto Stock contains the slurry within the machine leaving you house stain free. Call us today for your free estimate and save money rather than replace your windows. Our residential pressure washing services in the Verde Valley include Driveway cleaning, house washing, gutter cleaning, decks, and more. Our customers are always satisfied with our work and refer us to their friends and neighbors. Our dedication is to quality work and affordable prices. Our commercial services include store fronts, parking spots, sidewalks, etc. We also clean new cars and used cars with our spot free system. Mirrors always seem to be the biggest pain for people to clean streak free. They will seem to look great when you are finished cleaning them and then you turn on the light and notice that they are worse off then when you started. From bathrooms, closet doors, or even floor to ceiling walls, we will leave your mirrors immaculate. 20/20 Window Cleaning specializes in bringing your shower glass back to life. Showers seem to be ever growing trouble to maintain. All you have to do is forget to squeegee off the water and soap scum a few times and you will find yourself in trouble. It just doesn't seem to get clean anymore. If your shower glass hasn't been neglected to long, we can restore it back to life. Solar screens are a tough thing to keep looking new. We can get them clean again and even put a UV protestant on it to help keep your screen lasting longer. Once your solar panels are installed they need to be maintained. Solar panels get dirty and need to be cleaned at least 2 times a year. What is recommended is March/April after the winter rains and snow have passed, August/September to remove pollen that falls from the evergreens which all needs to be cleaned before it bonds. We use de-ionized water that removes minerals from the water. This system leaves no harsh minerals that will cause a build up and ruin the top of your panel. If your water is hard, you must have those nasty white spots on your glass windows and shower doors. Basically every where you have a faucet and use water, there you will have stains. If your hard water stains are not addressed, the minerals in the water will stain and permeate the surface making it very, if not extremely difficult to remove. So don't let those hard water stains take over. The sooner you address it, the less of a stain build up you will have to deal with it. We have a variety of ways to remove those stains as each situation has to be dealt with differently. This is not just a removing of spots but rather it is a restoration of your glass. This is a nasty job that nobody likes to do. It is time consuming and tedious. We don't mind tackling them whether they are inside or outside, we can make them look new again.